One of the stops my Rockies students and I made this summer was a dinosaur paleontology tour through the Two Medicine Dinosaur Center in Bynum, Montana. 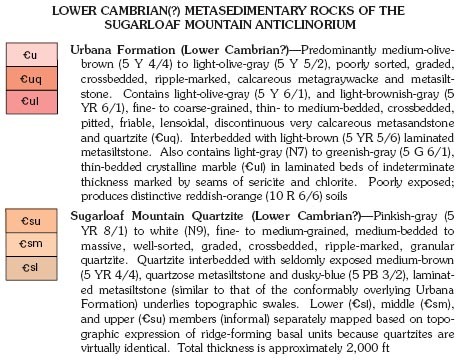 The folks there are very accommodating, and at my request gave the class a bit of stratigraphic context for the dinosaur fossils. 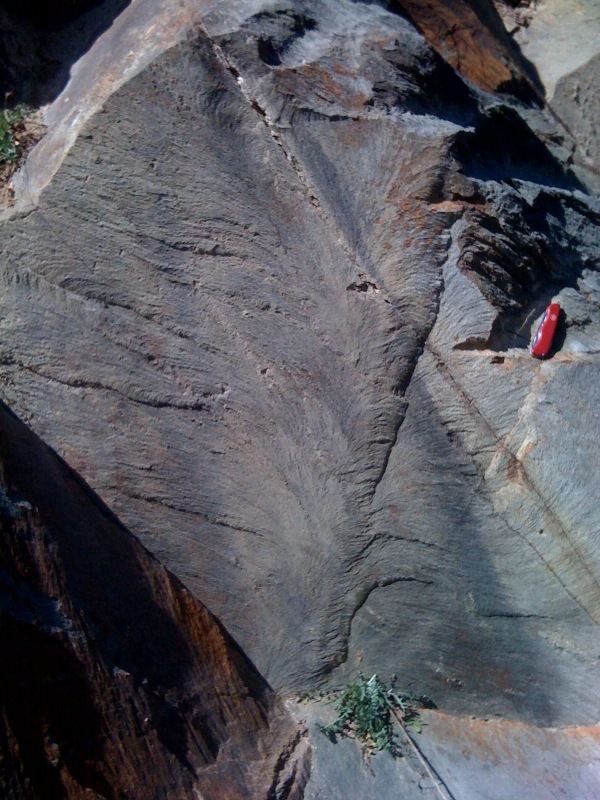 For instance, we visited the geologic formation which underlies the dinosaur-bearing Two Medicine Formation: it’s a beach sandstone called the Virgelle Formation. 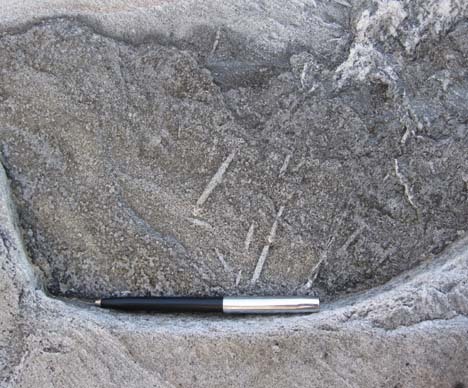 The Virgelle was deposited along the shore of the Western Interior Seaway, a Cretaceous-aged transgression of seawater onto the North American continent. Field notebook for scale (long side 18cm). By definition, σ1 is greater than σ3. 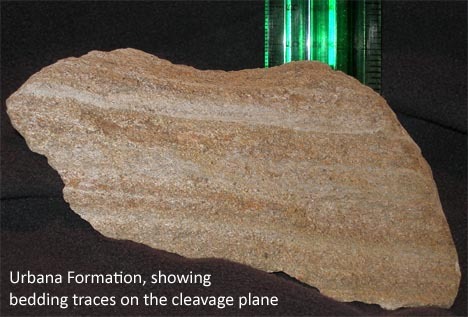 You’ll also note that the bedding planes in the Virgelle sandstone are planes of weakness, accommodating the extension by allowing blocks of sandstone to slip sideways over what amount to small-scale “detachment faults” (low-angle, upper block sliding downward relative to lower block). 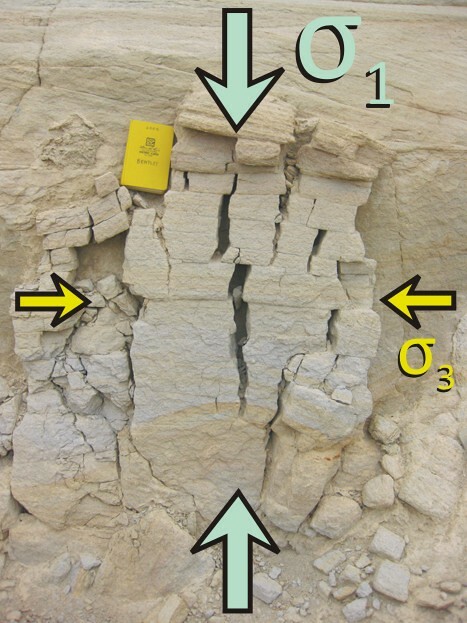 So does an understanding of these stress directions and the resulting structures’ orientation do us any good beyond this one lone slab of fractured sandstone? 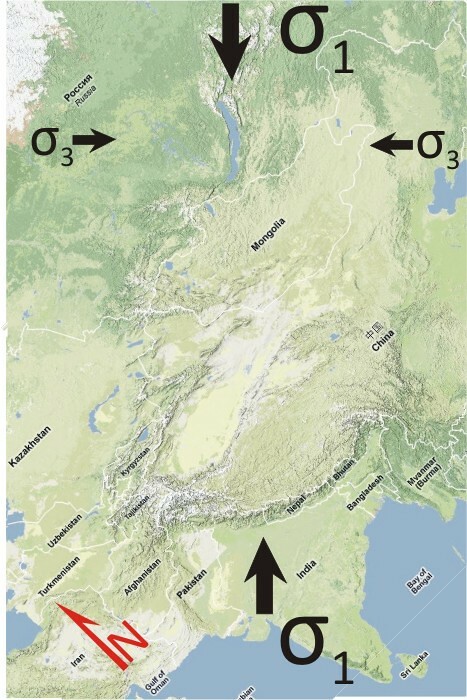 As the Indian subcontinent impacts the Eurasian continent, it moves towards the northeast. 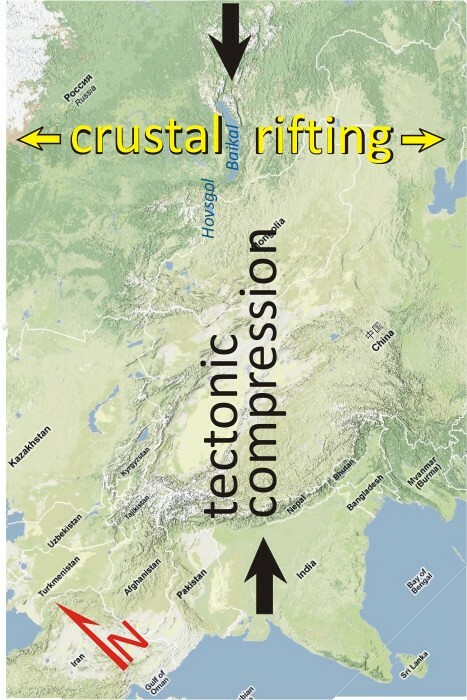 This results not only in the northwest-southeast-trending Himalayan mountain front at the site of impact, but also in extensional faulting further into the heart of the continent. 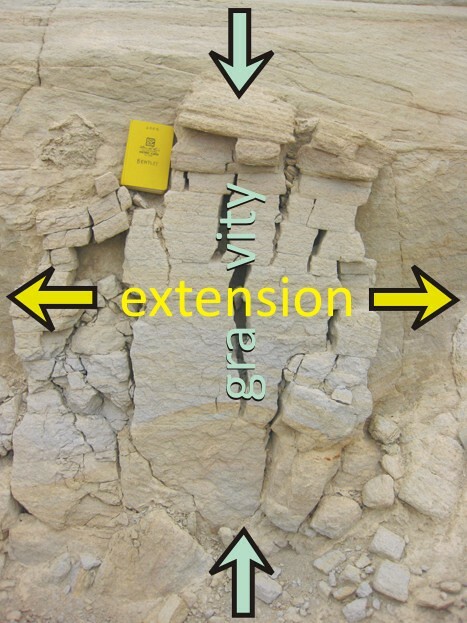 Down-dropped blocks of crust in desert areas show up as northeast-southwest-striking rift valleys, but in wetter areas, those low-lying cracks fill with water, and show up to us as linear lakes. 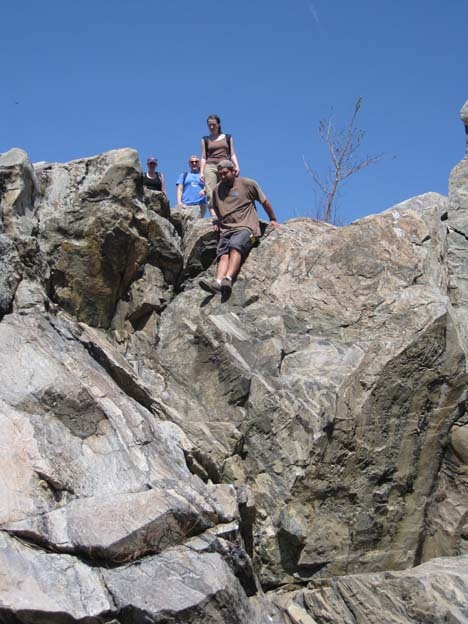 Lake Baikal in Russia is a famous example of this, but Mongolia’s Lake Hovsgol is a smaller version of the same thing. The lakes are oriented with their long axis ~parallel to the σ1 direction, as they have been opened up due to stretching in the σ3 direction. Caveat blog-reader: The kinematics and dynamics of central Asia are actually a lot more complicated than this simplistic picture I’ve painted. 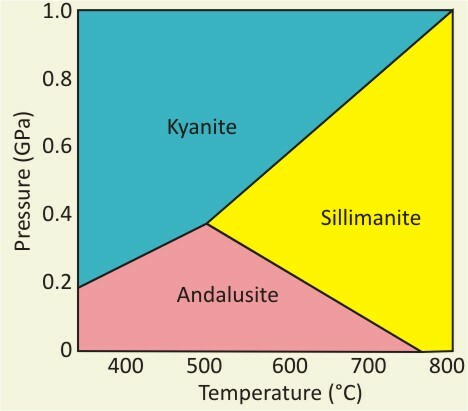 My main point in drawing the parallel between the two examples is that outcrop-scale structures can serve as analogues that can help us understand regional-scale processes. 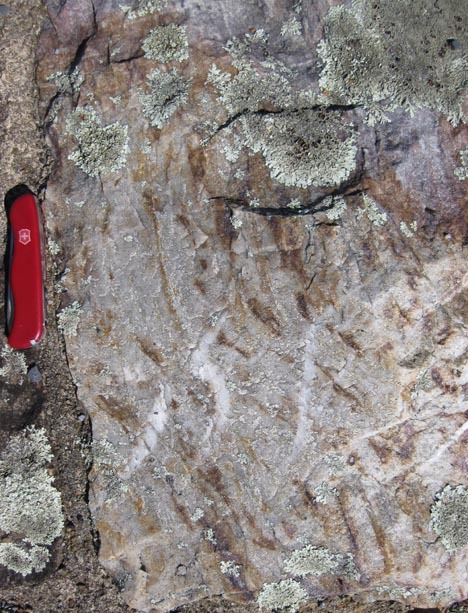 Justin, Joe, Nik, Aaron, Jeremy, and Danny find a chunky amphibolite boudin in metagraywacke. Notice how Jeremy is gesturing about the orientation of the metagraywacke foliation wrapping around the boudin. 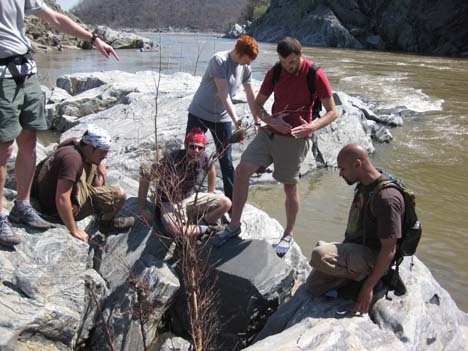 I’m headed back to the Billy Goat Trail today to discuss the trail’s geology with a crew from Sigma Xi‘s D.C. chapter. I wonder what we will discover today? 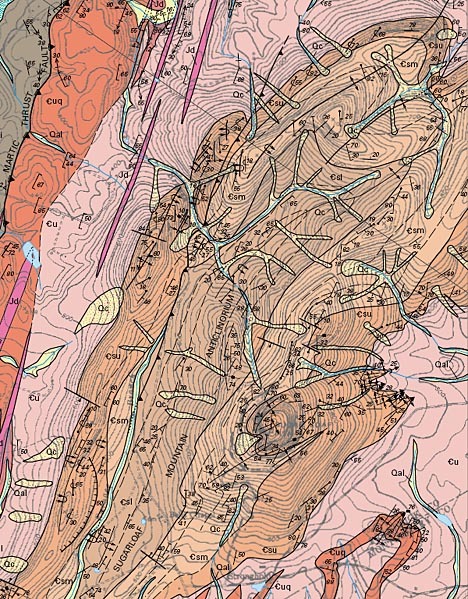 The final chapter in our Transect saga is now here. In some ways, it’s the least thrilling of the bunch. 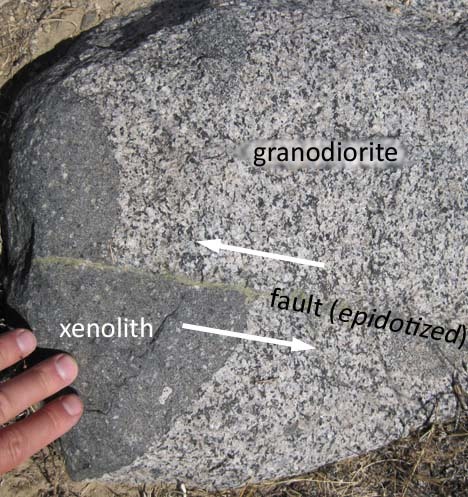 On the other hand, when I see a nice example of this structure, it makes me squeal like a little girl. 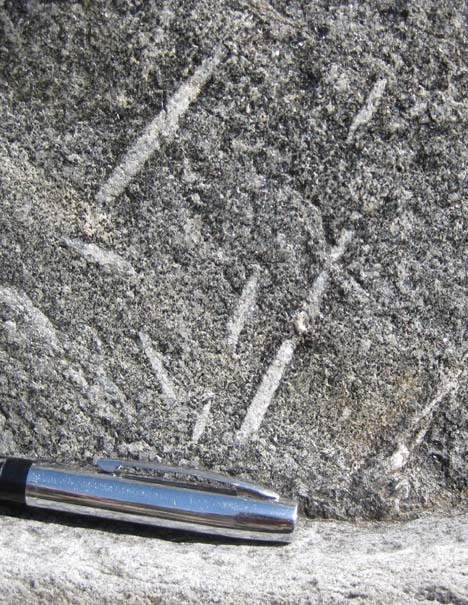 I refer, of course, to plumose structure, the small-scale architecture of a joint surface. 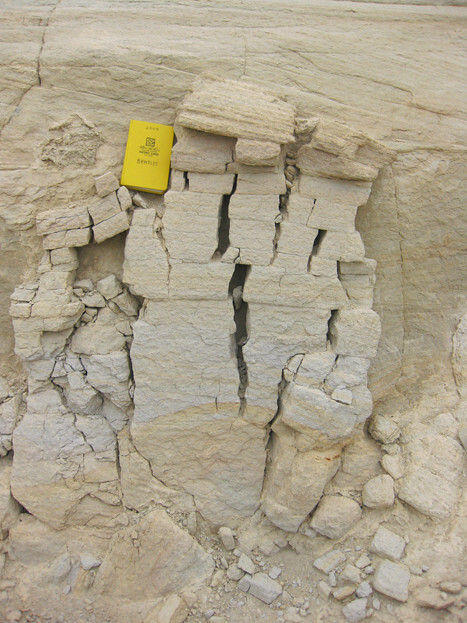 We saw multiple great examples on the trip, but my favorites came with the first post-lunch stop on Transect Trip day #1, at an outcrop of the Weverton Formation showing a fine-grained deposit of siltstone. I posted versions of both these photos previously via iPhone, but here I’ll give you the crisper Canon Elph version coupled with reposting of the iPhone shots for comparison purposes. 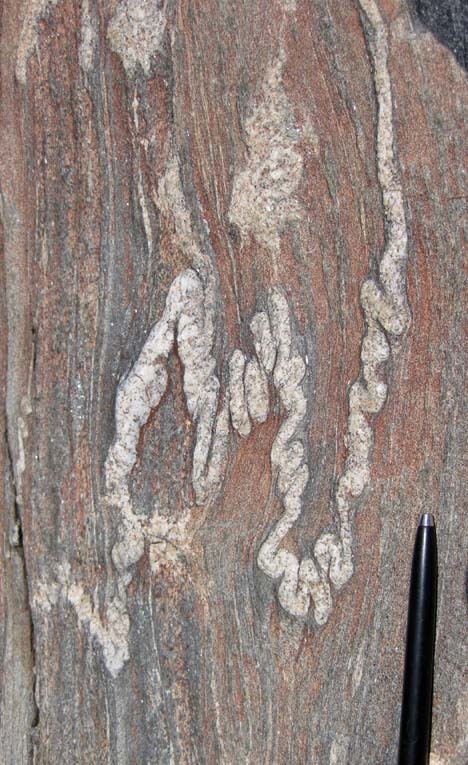 Plumose structure branches out in the joint propagation direction, the curvilinear “plumes” are thought to be perpendicular to the leading edge of the joint as it cracks through the rock. 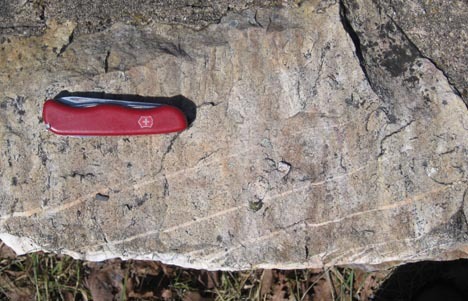 These late-stage brittle features may be related to the very latest part of Alleghanian deformation, or they may be related to recent uplift of these rocks. All righty, then. I think that brings us up to the present day. 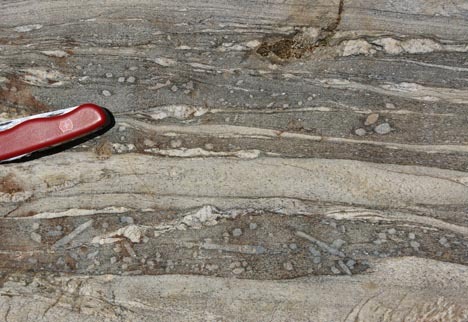 Those of you who requested more details about the live-geoblogged photos, has this series answered your questions? If not, what do you need more details on? Good Lord! Ain’t those things beautiful? 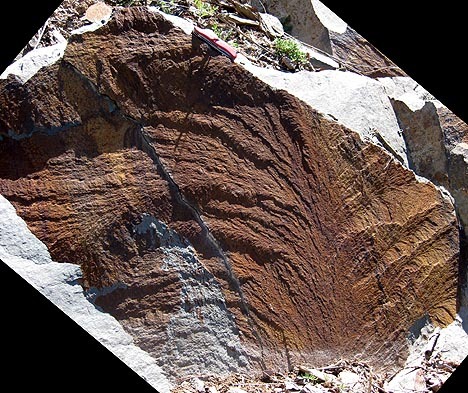 They also give us a lovely sense of the kinematics (relative motions) of the blocks of Antietam sandstone on either side of this sheared zone. 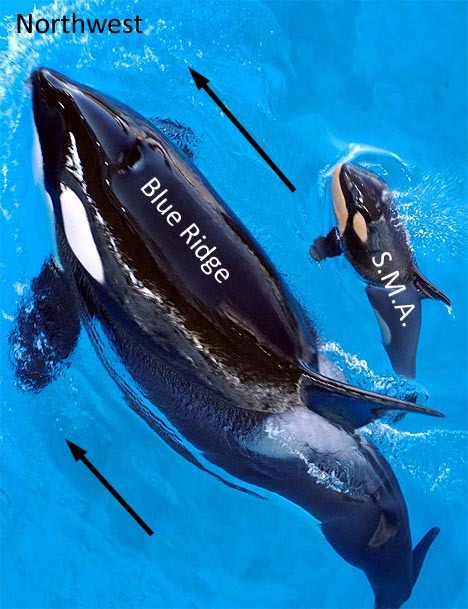 In the case of the image above, the left side of the photo has moved “down” relative to the right side. 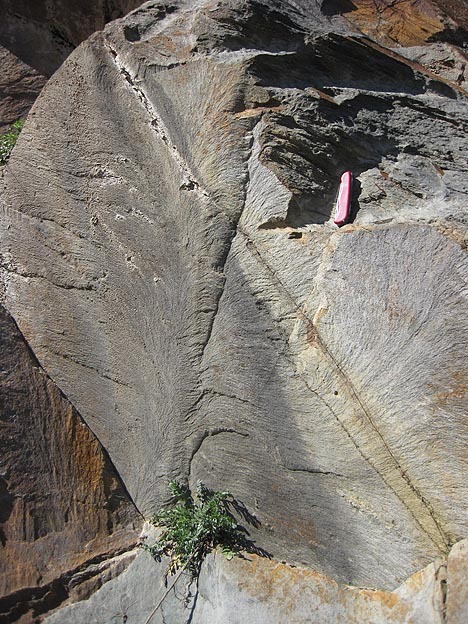 The rock in between has torn and stretched, with the gashes opening up at right angles to the maximum stretching direction. 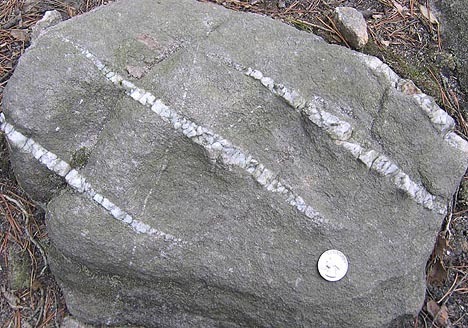 As deformation proceeds, of course, the gashes rotate and deform, folding into “S” shapes. 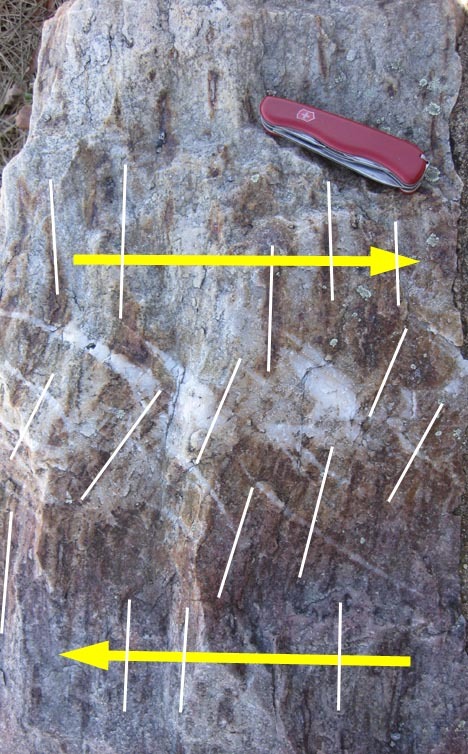 What you’re looking at in the image immediately above is a tension gash array that was a zone of weakness, exploited by later brittle deformation. 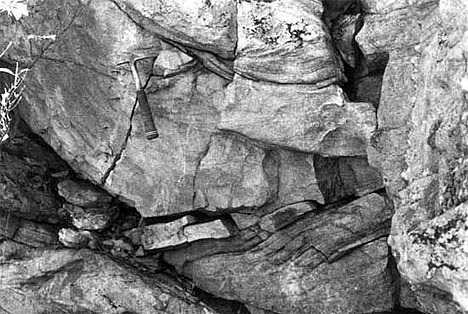 The fracture which defines the edge of this block cracked through those old brittle-ductile tension gashes and split them clean in half. 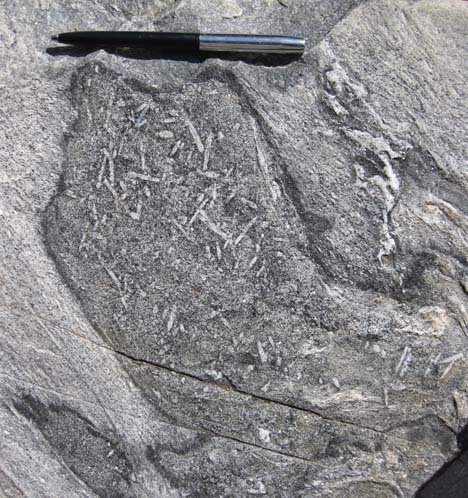 Remember the Skolithos trace fossils? 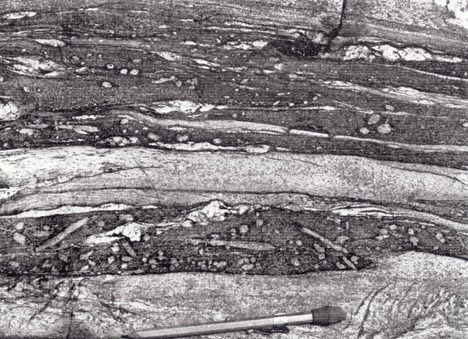 Here, you’re looking at a sideways cross section through some cylindrical Skolithos as they are disrupted by this zone of shearing. 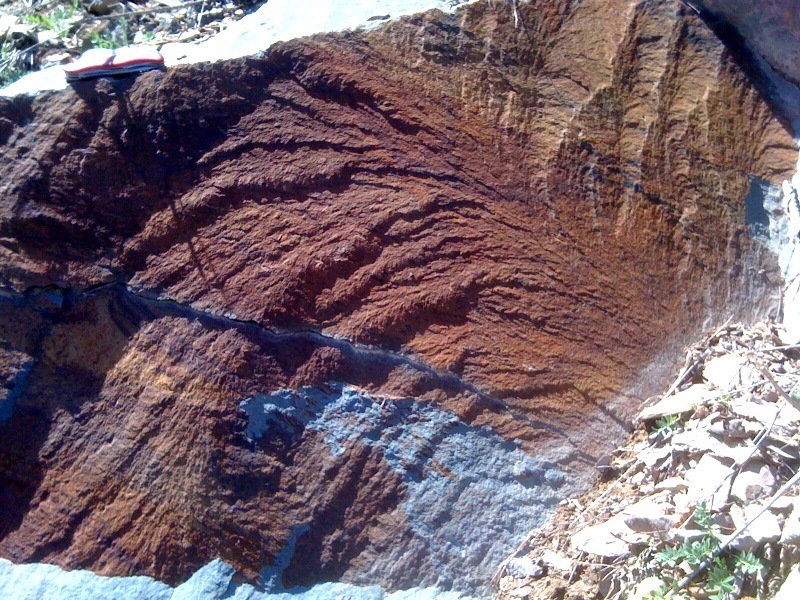 Note that the burrows tend to be highlighted by rust (hematite) staining: the brown lines that run roughly from the top left of the photo towards the bottom right. But look what happens to the orientation of those tubes where they are cut by the tension gash arrays: they are deflected into a new orientation, rotated from their original orientation! 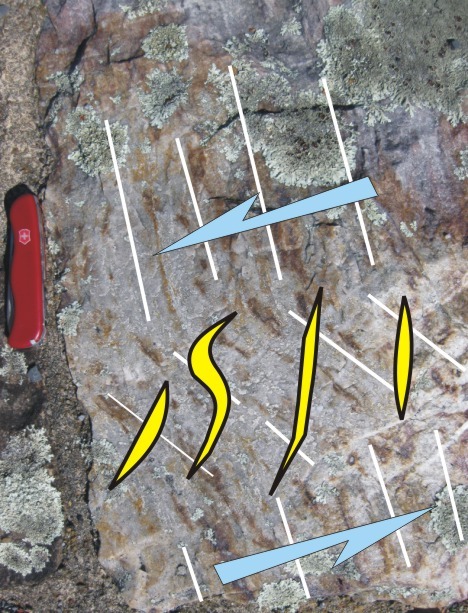 I’ve drawn white lines to show the orientation of the Skolithos tubes in their undeformed and deformed states, colored the tension gashes yellow, and drawn on a set of blue arrows to show my kinematic interpretation (top to the left). Go ahead. Tell me you’re not impressed with that. I dare you. That is frakking AWESOME.